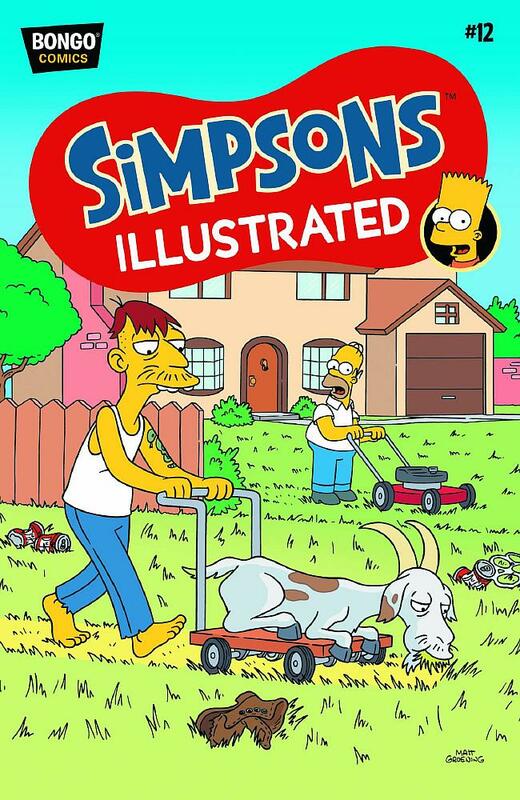 Simpsons Illustrated #12 is the twelfth issue of Simpsons Illustrated. It was released on July 30, 2014. "Ned Flanders goes on a road trip of self-discovery, and while he's away, Cletus and his kinfolk set-up housekeeping at the Flanderosa. It doesn't take long before their backwoodsy ways have Homer fussin' and a fixin' for feud. Then while visiting Frink Labs, Bartman uses the professor's newest invention to do the family laundry, and soon the genetic material from the clothing melds with Frink's concoction to create sentient metal creatures that resemble the Simpsons. Ultimately, it's up to the archenemy of evil, along with the Metal Simpsons to cleanup Homer's latest mess at the nuclear power plant. Also, Bart concocts an amusing Angry Dad adventure, and asks Martin to help him get to some cool websites." Main article: Feud, Glorious Feud! Modified on July 25, 2017, at 08:43.